ALS is a progressive, fatal motoneurone disease, ultimately leading to paralysis and respiratory failure within 3-5 years. There is currently only one FDA-approved drug, Riluzole, but its lack of disease prolongation combined with the aggressive disease nature means identifying new treatments is essential. This review highlights 3 of the most current and promising research areas. Recent Phase 1 Clinical trials have proven safety of stem cell (SC) implantation in humans. Parallel rodent SC models show positive results in both decelerating disease progression and promoting anti-inflammatory neuronal protection. 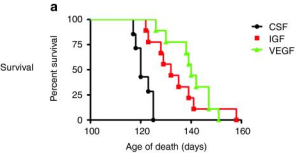 Supplementary use of growth factors also shows potential regarding motoneurone survival and dendrite length in cultures, and survival rates in mouse models. Knockout of glial xC- glutamate anti-porter significantly reduces excessive glutamate levels in neurones by 70%, compared to xC- +/+ microglia. Knockout also reduces levels of pro-inflammatory markers. These findings highlight vital role of xC- system in reducing neuronal glutamate excitotoxicity. Antisense technologies effectively reduced SOD1 protein and mRNA levels, consistent in CSF and brain of SOD1 rodent cortices. This supports SOD1 as a good biomarker for future antisense studies. Overall, there is promising research being conducted. However improvements in clinical trial techniques must be addressed in order to reliably compare findings from future studies, and allow identification of a cure in the future. Also known as ‘Lou Gehrig’s Disease’, Amyotrophic Lateral Sclerosis (ALS) involves loss of upper and lower motoneurones from the brainstem and spinal cord. Symptoms progress from difficulty in limb movement to paralysis, and finally respiratory failure, the biggest cause of death in ALS. With a prevalence of approx. 2:100,000 and average onset age of 55 years, death usually occurs 3-5 years after onset. Although first identified in 1869 by Jean-Martin Charcot, there remain no conclusive disease causes. The disease is classified into 2 types: Familial ALS (fALS), the inherited form, is responsible for approx. 10% of all cases. There are a handful of genetic mutations linked to fALS, including: C90RF72, TDP-43, FUS, Ubiquilin-2, and currently most relevant in disease-models, Cu2+/Zn2+ Superoxide Dismutase (SOD1). Sporadic (sALS) form comprises the majority of cases, and this unknown nature of the disease makes targeted treatments challenging. Riluzole is currently the only FDA approved treatment for ALS, increasing life expectancy by 2 months. In 2011, ‘Nuedexta’ was also approved as a treatment for pseudobulbar effects in ND diseases. Patients must otherwise rely on palliative care to improve quality of life. This review will focus on the most current and widely researched areas. Proposed mechanisms of disease are beyond the scope of this review, but can be found in a review by Cleveland and Rothstein (2001). Due to its infamous potential, stem cell (SC) therapy is perhaps the most widely researched treatment area. SC therapy aims to improve symptoms rather than cure the disease, by either targeting re-growth of neurones or promoting their survival. Here we will focus on clinical and pre-clinical SC trials in the last 5 years. One proposed treatment method is to replace dying motoneurones with SCs. Recent Phase 1 Clinical Trials by Glass et al., (2012) and Feldman et al., (2014) studied the safety of lumbar and cervical SC injections, respectively. Both trials found good patient tolerance and sufficient safety to continue with future trials. Feldman et al. also used histochemical analysis to address concerns over unpredictable SC migration, by highlighting successfully transplanted SCs in spinal cord slices, Figure 1. Despite multiple limitations to the experimental technique, such as absence of a control group, results indicated early SC transplantation has a good chance of slowing disease progression in ALS patients, as 50% of patients showed improvement in 6-15 month post-trial check-ups. The corresponding Phase II Trial commenced in September 2013, and is due for completion this month. 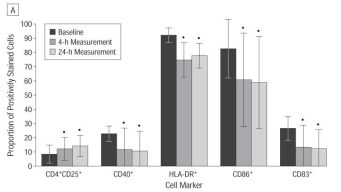 Figure 2 shows a previous study by Karussis et al., (2010) where SC injection leads to a significant increase in immune-regulatory cells (CD4+/CD25+) and an overall decreased immune response. Reduction in immune response over 24hrs was in fact greater than seen in immunomodulatory medicines, suggesting additional mode of action for SC therapy. Unsuccessful trials in the late 1990s to treat ALS with growth factors (GFs) prompted further studies into appropriate CNS targeting. Development of the SOD1-mutant rat model allowed Suzuki et al., in 2008, to address these delivery issues in a study using SCs as GF vectors. They found GF delivery to mid-stage SOD1 rodents showed increased neuromuscular connections, and a lifespan increase of 28 days, possibly due to reduced neuronal loss. Viral vectors for trophic factors (TFs) provide an alternative delivery route, and in 2010, Dodge et al., carried out mouse embryonic-SC motoneurone studies in which expression of TFs IGF-1 and VEGF-165 using viral vector, AAV4, allowed successful delivery of TFs to entirety of CNS. This slowed MN decline and increased mouse survival. Figure 3 shows initial culture studies using mouse-derived embryonic motoneurone SCs, showing clear protective action on neurones. Subsequent mouse studies showed increased survival and decelerated reduction in hindlimb grip-strength and stamina on the rotarod, seen in Figure 4. It is worth noting that combined delivery of both TFs showed no synergistic effect, probably due to their affecting the same pathway. Subsequently, in 2013, Krakora et al., modified human mesenchymal SCs to further investigate synergistic effect of combined GFs. 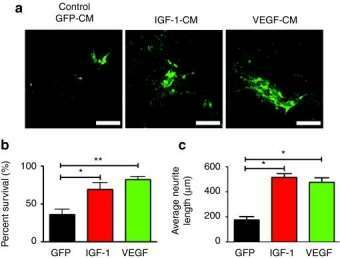 A synergistic effect between GDNF + VEGF was seen due to their action on different signalling cascades. This shows promise for future studies into improved neuronal survival. Phase-1 clinical-trials have shown safety of SC injection into CNS with promising, if unreliable, patient outcomes. The mechanism of improvement still unidentified, but hints at inflammatory regulation in neural protection may open an interesting avenue. GF application shows further potential based on rodent/mice studies with a proven effect at slowing disease progression and neuronal loss. SCs make suitable GF vectors as can be made to express/over-express GFs. Combining GF models with SC vectors for targeted delivery requires further exploration. Future trials must consider frequency, dose and administration technique. Mouse ALS models by Beers et al., (2011) and Liao et al., (2012) indicate microglia conversion from M2 (anti-inflammatory) to M1 (pro-inflammatory) state during disease. Believed to be due to glutamate toxicity, therapeutic work should focus on reducing excessive neuronal glutamate level, and reducing resultant pro-inflammatory response. In 2014, Mesci et al., studied the xC- system; a glial antiporter exchanging cysteine for glutamate release, causing increased neuronal glutamate. The study aimed to show blocking xC- would reduce excessive glutamate release and affect M1/M2 state, to reduce inflammation. xCT (transporter gene) -/- mouse microglial studies demonstrated a significant 70% reduction in glutamate release compared to XC- +/+. 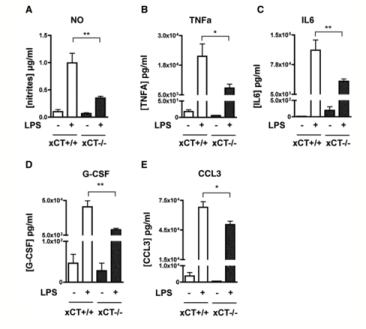 Furthermore, Figure 5 shows significantly increased pro-inflammatory factors in xC- +/+ mice microglia compared to -/-, hinting at a shift towards the M1 microglial phenotype via xC-. Interestingly, Mesci et al., also noted a 10-fold increase in anti-inflammatory M2 marker levels at pre-symptomatic phase in -/- mice which drops off at disease onset, indicating M1/M2 shift upon disease onset. Encouragingly, -/- microglia showed significant increase in motoneurone survival in -/- vs +/+ microglia, at 45% and 35% survival, respectively. This is indicative of a less neurotoxic environment. 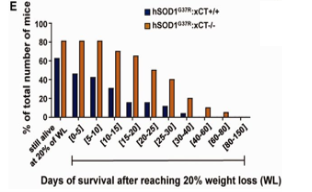 Finally, xC- -/- SOD1 mutated mice showed an overall deceleration in disease progression, shown by increased survival rates following advanced disease stage (20% weight loss) in Figure 6. These anti-excitotoxicity findings are consistent with the action of Riluzole. Future drugs may target xC- system, however current antagonists are poorly specific and available to brain. Identification of a more suitable antagonist would be a good priority before further clinical trials. Antisense oligonucleotides (ASOs) bind to specific mRNA sequences to cause mRNA degradation. 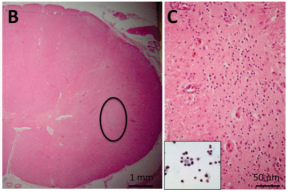 In 2013, Leah et al., conducted studies in SOD1 rodents and human subjects with neurodegenerative diseases. SOD1-targeting ASOs were introduced to subjects to reduce SOD1 levels. They found both SOD1 mRNA and protein fell by 69±4% and 48±14%, respectively, in rodent cortices. Interestingly, this matched reduced protein levels by 42±14% in rodent CSF, indicating CSF levels are a good measure of levels in brain. Unfortuntely, SOD1 cannot be a specific ALS marker due to its presence in other neurodegenerative diseases. However, its observed constant levels over time supports SOD1 as a good biomarker in indicating efficacy of antisense technologies and its effective targeting by ASOs may be useful in measuring brain SOD1 levels via CSF levels in future studies. A Phase 1 Clinical Trial by Miller et al., (2013) to determine safety of single-dose intrathecal injection of ASOs found no safety concerns. However, liver cancer and neuropathy was previously seen in cases of chronic low SOD1 levels (Elchuri et al., 2005), so long-term dosage effects must be carefully monitored. This review was restricted to three main research areas, but areas such as susceptibility gene identification, oxidative stress and protein misfolding, are also being explored. Current research shows promise, especially in SOD1 rodent models and positive safety data from Phase 1 Trials. SCs continue to have vast potential, and when combined with GFs have shown encouraging effects on disease progression in rodent models. Reliability of these studies, however, must be improved in order to draw accurate conclusions and compare findings from related studies. Ideally, a ‘standard trial protocol’ should be implemented. Trials must also consider long-term effects of reduced SOD1 levels (in antisense techniques) and immunosuppressant use (with stem cells). Some issues may possibly be alleviated by recent development of new autologous SC models (Meyers et al., 2014). In short, current ALS treatments remain palliative care and Riluzole, but with new developments continuously emerging there is definitely an exciting research landscape ahead. In October 2014, ALSA requested Phase II Trial proposals to accelerate work in this area, meaning that the race is on to find suitable ALS treatment that may help patient prognosis in the future.